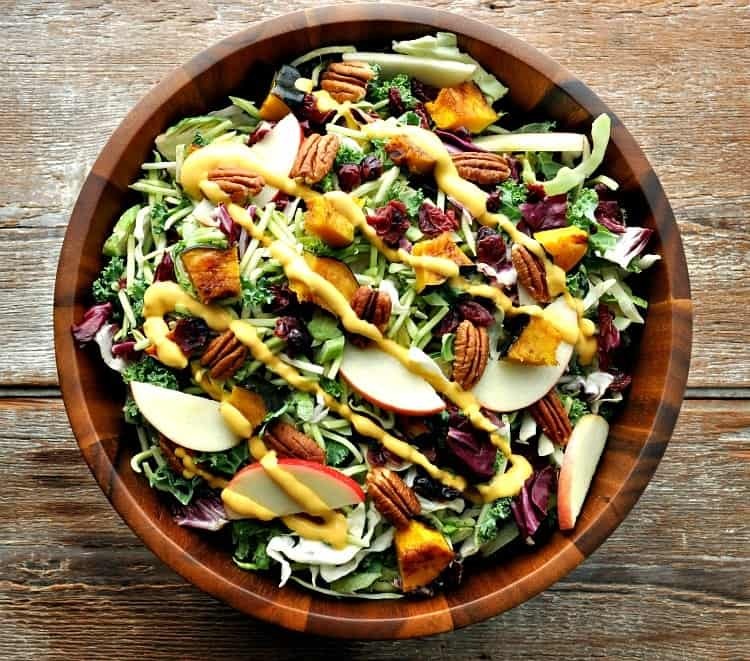 This Fall Harvest Salad with Pumpkin Goddess Dressing celebrates the bounty of the season in a beautiful combination of tastes and textures! 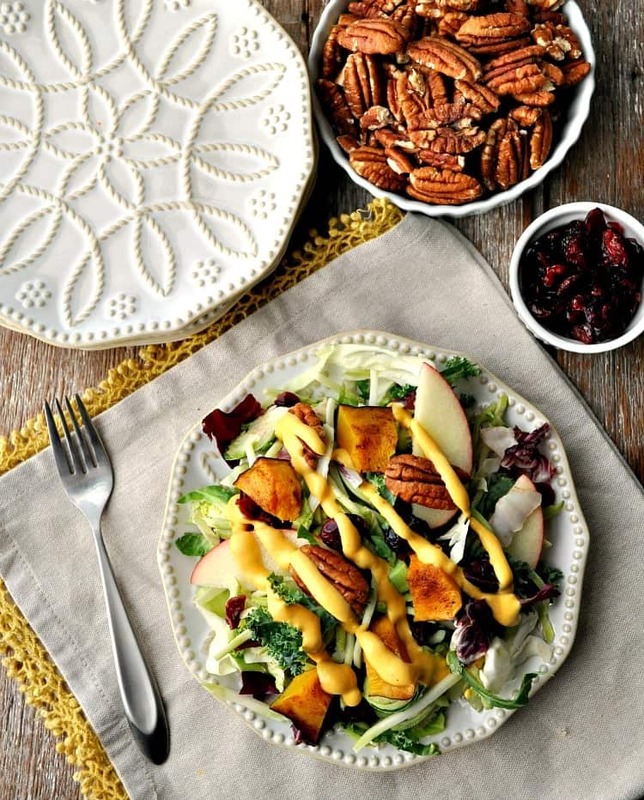 This harvest salad is a lighter, more vibrant option for your holiday table, which pairs perfectly with turkey, stuffing, cranberry sauce, and any of your other Thanksgiving favorites. And who wouldn’t want these fresh, seasonal ingredients on a festive table?! They are the quintessential flavors of autumn! This recipe calls for roasted acorn squash, which is tossed with maple syrup and seasoning for a crispy, caramelized, sweet addition to the salad. While the acorn squash roasts in a 400-degree oven for about 20 minutes, you’ll have just enough time to make the dressing and prep the rest of your nutritious ingredients! This is the easiest way to make a homemade salad dressing — just blend everything together! 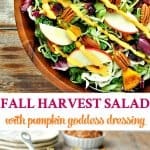 The creamy base of the pumpkin goddess dressing is nonfat Greek yogurt, in order to keep it light. If you prefer a more decadent taste, just substitute with either sour cream or mayonnaise (or a combination of the two). You’ll love how the creamy tang of the yogurt is contrasted with sweet pumpkin and zesty seasoning. It’s subtle and festive, without overpowering the salad. 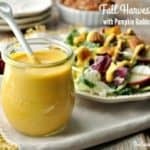 The creamy and healthy pumpkin salad dressing is really just a fun twist on my favorite Green Goddess Dressing, which is a time-tested and well-loved recipe that was passed down to me from my mother-in-law’s friend. It’s a must-try! 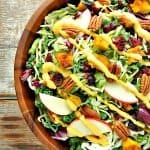 So toss together some of autumn’s tastiest ingredients in a beautiful and delicious salad that is perfectly “fit” for the holidays! It’s a delicious Thanksgiving side dish to help you enjoy this special time of year with family and friends. But don’t worry — you don’t have to wait until late November to enjoy the goodness! This salad is also a great healthy side dish with a warm bowl of roasted butternut squash soup, or you can add some chicken on top for a light and satisfying main course. 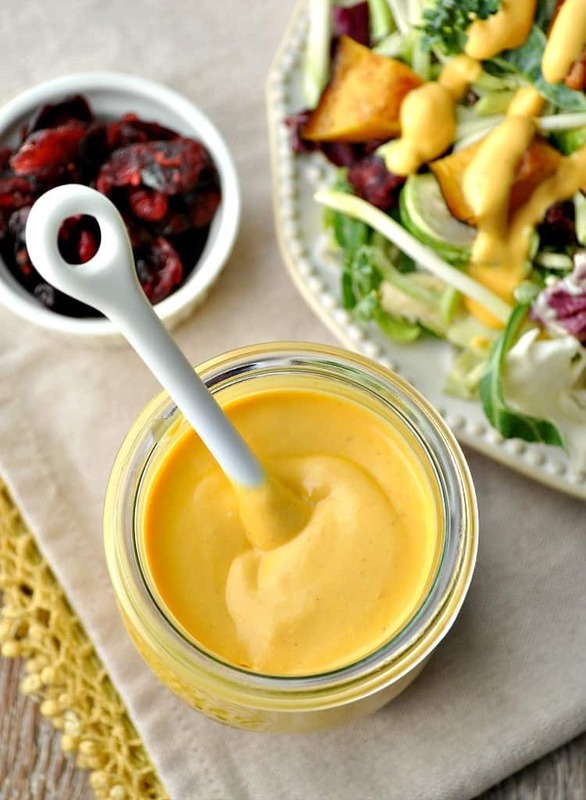 Use mayonnaise in lieu of the Greek yogurt for a creamier, less tangy dressing. 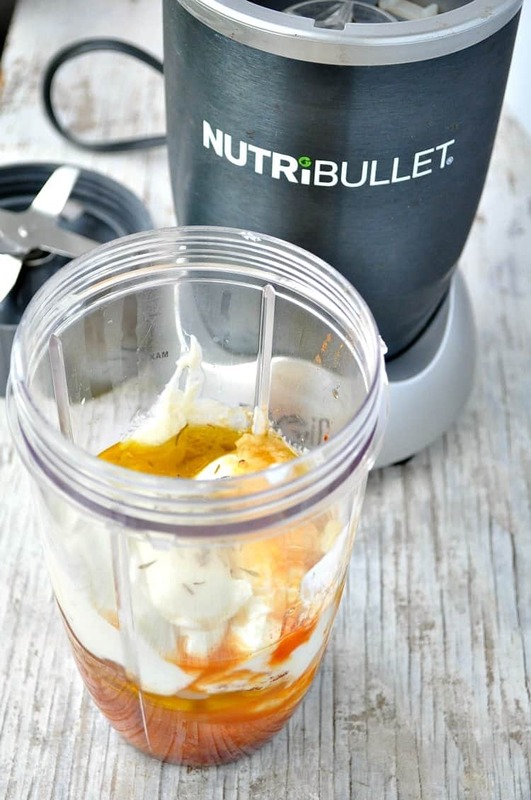 Place all ingredients in a blender and combine. Chill until ready to use. Slice squash lengthwise, remove seeds, and slice horizontally into ½-inch thick rounds. Place sliced squash in a single layer on prepared baking sheet. Drizzle with olive oil and maple syrup, sprinkle with a dash of cinnamon and salt, to taste. Toss squash to coat. Bake squash at 400 degree F for approximately 20 minutes (or until tender and caramelized), flipping halfway through. Once the squash has cooled, cut it into bite-sized pieces and place it in a large salad bowl with the remaining ingredients. Add Pumpkin Goddess dressing and toss gently. Serve immediately. This is such a gorgeous salad, Blair! I love all of the hearty ingredients and colors in here. And I’m in awe of that pumpkin goddess dressing. I think I could eat it by the spoonful! 🙂 This sounds like the perfect salad for Thanksgiving! I am very excited to make this beautiful salad this Thanksgiving! I just wanted to clarify on the dressing: if I opt not to use sour cream and just use all plain greek yogurt it would be a total of 1 1/2 cups of the yogurt is that correct? This salad is stunning, Blair! I’m a salad girl and love to see new creative ways to enjoy it. I want to drink that dressing! It sounds delicious!! Thanks so much, Jen! I’m a salad girl too…love them — especially when they involve lots of textures and flavors! This salad looks absolutely glorious, Blair!! 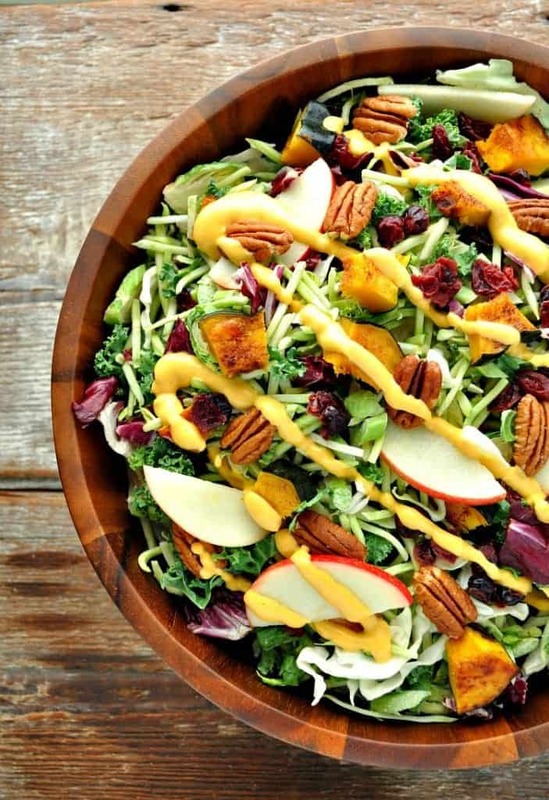 It’s bursting with so much flavor, and holy cow–that dressing! Just YUM!! Oh my goodness, this salad is everything I would want and more! I think I could drink that dressing, it sounds incredible! so making this for thanksgiving this week — beautiful and sounds oh so tasty! Why do you have Greek Yogurt listed twice in the dressing recipe? The recipe calls for a 1/2 cup of sour cream, OR you can use an additional 1/2 cup of Greek yogurt. Sorry that wasn’t clear! You could also use mayonnaise in lieu of the sour cream, it just wouldn’t be quite as light. Any of those options will work, though! 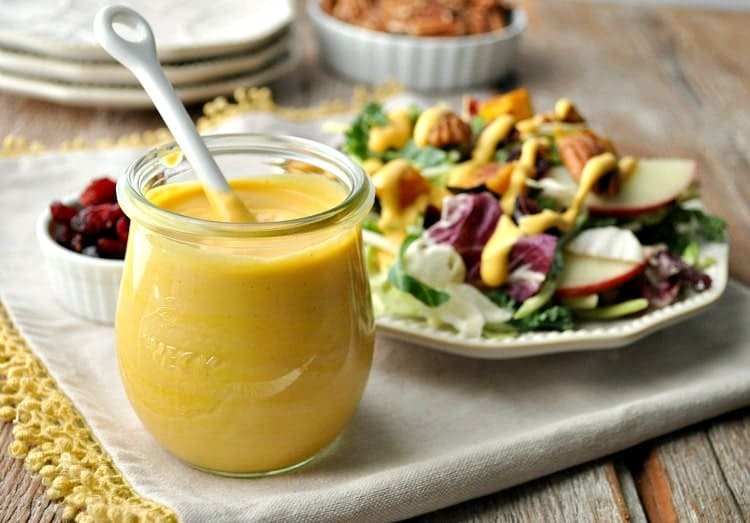 Can you store this dressing in your refrigerator and if so for how long? Seeing the rind left on the chunks of acorn squash in the salad took me aback…squash rind in my forkful of otherwise delicious salad would not be pleasant! I’ll plan to take off the rind after the slices have cooled from roasting, or use chunks of roasted sweet potato instead. I look forward to taking this to a church potluck this weekend! Thanks for the great recipe ~ I’ll be using this for Thanksgiving! How did the dressing come out as such a vibrant color? Mine is only a pale tan/creme vs the bright orange/yellow..
Hi, Lauren! I’m not sure why mine would look different. I didn’t do anything special other than what the recipe says. Hope yours still tastes good! Made this salad dressing yesterday and absolutely loved it! New Fall favorite! That’s wonderful, Caryn! I’m glad that you enjoyed it! Thanks for letting me know! Blair can this dressing be made ahead of time and if how many days? Looking forward to sharing it with my family! Hi, Paula! Yes! It’s good in the refrigerator for at least a few days. You’ll just want to give it a good shake, whisk, or stir again after it’s been sitting. Enjoy! At a glance onlookers saw a “blender nightmare” that turned out to be one of the most delightful seasonal salads they’ve ever tasted.